Every so often I come across a rare ensemble of words that capture my thoughts in a way I could only dream of. Historian Will Durant, in his delightful book, The Story of Philosophy does that as he pens a beautiful description for his love of ideas and philosophy. There is a pleasure in philosophy, and a lure even in the mirages of metaphysics, which every student feels until the coarse necessities of physical existence drag him from the heights of thought into the mart of economic strife and gain. Most of us have known some golden days in the June of life when philosophy was in fact what Plato calls it, “that dear delight”; when the love of a modestly elusive Truth seemed more glorious, incomparably, than the lust for the ways of the flesh and the dross of the world. And there is always some wistful remnant in us of that early wooing of wisdom. “Life has meaning,” we feel with Browning “to find its meaning is my meat and drink.” So much of our lives is meaningless, a self-cancelling vacillation and futility; we strive with the chaos about us and within; but we would believe all ‘ the while that there is something vital and significant in us, could we but decipher our own souls. We want to understand; “life means for us constantly to transform into light and flame all that we are or meet with”; we are like Mitya in The Brothers Karamazov “one of those who don’t want millions, but an answer to their questions”; we want to seize the value and perspective of passing things, and so to pull ourselves up out of the maelstrom of daily circumstance. 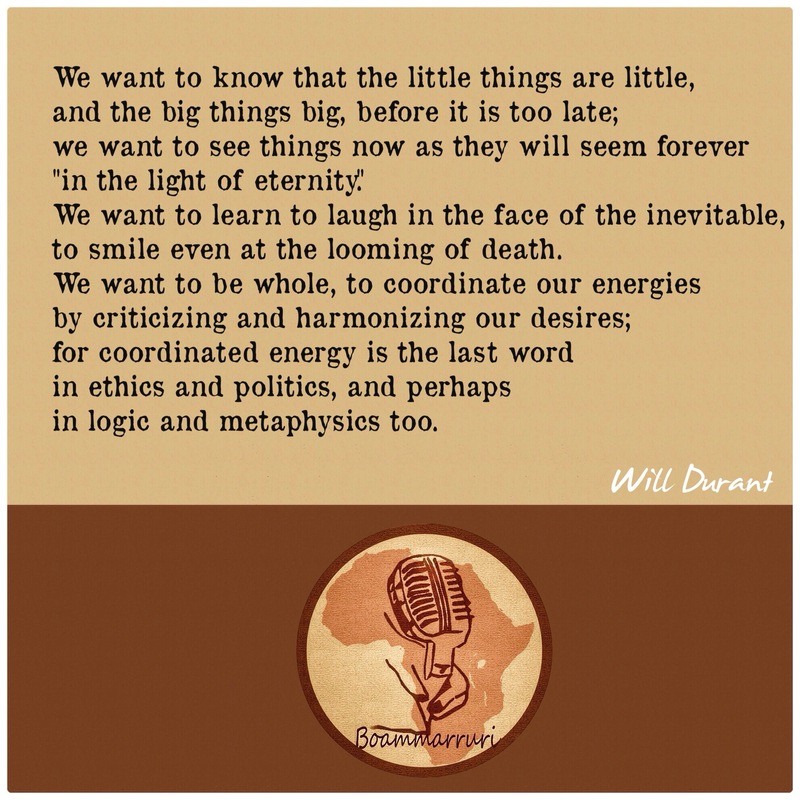 We want to know that the little things are little, and the big things big, before it is too late; we want to see things now as they will seem forever “in the light of eternity.” We want to learn to laugh in the face of the inevitable, to smile even at the looming of death. We want to be whole, to coordinate our energies by criticizing and harmonizing our desires; for coordinated energy is the last word in ethics and politics, and perhaps in logic and metaphysics too. “To be a philosopher,” said Thoreau, “is not merely to have subtle thoughts, nor even to found a school, but so to love wisdom as to live, according to its dictates, a life of simplicity, independence, magnanimity, and trust.” We may be sure that if we can but find wisdom, all things else will be added unto us. “Seek ye first the good things of the mind,” Bacon admonishes us, “and the rest will either be supplied or its loss will not be felt.” Truth will not make us rich, but it will make us free. Previous Previous post: Is morality an evolutionary instinct?